Publish from Lectora to Saba in one click! Ever wish your authoring tool and LMS worked better together? Well, if you are using Saba, we have good news! Saba provides talent development solutions that put people and teams in the driver’s seat of their own development experience – learning on their own, from you, and from each other – all while connected to and delivering on your business goals. With Saba, you can provide the personalized, interactive and collaborative experiences your people need to grow and develop, feel valued, and create value for your business. If that sounds familiar, it should! Lectora Online was designed with the concept of bringing elevated and growth-enabled eLearning to your industry. We’ve joined forces with Saba to give you a built-in way to publish content from Lectora Online directly to your talent management solution. In fact, with our latest release, we included the ability to publish directly to Saba Cloud – in one click! To enable this publish option, go into Organization Settings (you must be an administrator) and click the checkbox associated to Saba Cloud Integration. Note: You can also set up your Saba Repository settings in Organization Settings so they will be shared across your organization. To enable this option, select the folder to which you want to push your published content and proceed with publishing. After publishing finishes, you will see a button to send the published course to the folder you specified. 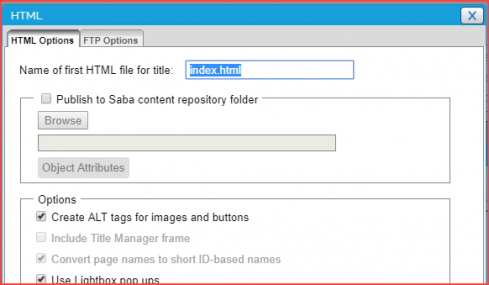 When publishing, a checkbox will appear giving you the ability to publish to a Saba content repository folder. Not already a Lectora Online customer? Sign up for your free trial today!